Villainous Iago’s creed, which holds that man is the sport of unjust fate, must be on the minds of impresarios everywhere when opening night emergencies befall. So it was at the Lyric Opera’s gala opener Oct. 6, when Verdi’s “Otello” was on the bill for an early evening performance that segued into the Lyric’s annual black-tie soirée. 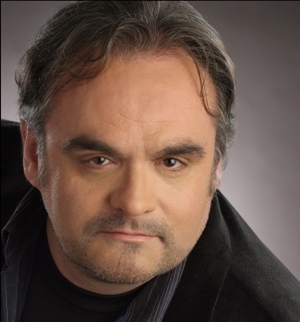 The revival of Sir Peter Hall’s 2001 production, led by French conductor Bertrand de Billy in his Lyric debut, was to have featured two front-rank singers of the Shakespearean Iago and Otello roles — German bass-baritone Falk Struckmann and South African tenor Johan Botha — who most recently sang ‘”Otello” together at the Metropolitan Opera last season. These veterans were to chaperone the Puerto Rican-born soprano Ana María Martínez in her first-ever performances as the tragic and innocent Desdemona, whom Iago so insidiously slanders. Verdi’s evil Iago is one of the great bass-baritone roles in all of opera, with a dazzling, nihilistic “Credo” at the beginning of Act 2 that is a show stopper (“I believe in a cruel God…”). The ailing bass-baritone Falk Struckmann must have figured that if he could just manage his debilitating flareup of allergies through that crucial scene, the rest would be a coast for him, and Lyric’s evening could smoothly sail right into its festive opera ball. It was not to be. Although in the first act, Struckmann painted an authoritative impression of the sociopath who plots against his boss by manipulating others to do his dirty work, the artist’s vocal cords seemed under increasing stress. Thus it was that American baritone Todd Thomas strode onstage at the beginning of Act 2 to sing the famous “Credo” and to carry forward with Iago’s shameless puppeteering. A veteran of the role at reliable regional companies, Thomas had the “Credo” well in hand as a completely shaped dramatic scene that was his alone. One could feel the unnerved house begin to settle down. Thomas’s adrenalin must have been off the charts, yet he gamely improvised the finer points of staging in his subsequent encounter with Otello, when Iago’s smarmy insinuations about Desdemona begin to arouse alarm. Thomas even matched the big-voiced Botha, power note for power note, at the end of their duet “Si, pel ciel,” when Otello, now fully afire with anger from Iago’s stoking, vows deadly revenge. Yet there was a limit to what was possible dramatically and musically under the circumstances. Nor was the performance overall successful despite Thomas’s valiant save. Johan Botha is a stalwart, ringing presence, with a voice that’s thrilling at its height, less adept at vocal delicacy or intimacy of expression. Once certain in his own mind of Desdemona’s guilt, his Otello was menacing in his confusion, truly terrifying. But his gentler scenes with Martínez did not have as much dramatic texture, and their mutually adoring duet at the end of Act 1, which dissolves into some of Verdi’s most exquisitely breathless music, was the less for it. This couple is more exciting to be around when they’re stressed. Martínez is still a Desdemona aborning, already heart-breaking in her Act 4 “Willow Song” and the despairing “Ave Maria” that signals she knows death is a certainty. In these moments she was glorious as a hint of other-worldliness crept into her silver sound, and her spellbinding pianissimos, delicate threads of intense emotion, achieved true dramatic power. Her Desdemona’s trajectory from adoring lover in Act 1 to honorable friend, uneasy wife, anguished, terrified, condemned and ultimately hopeless victim was, however, a more generalized arc that will doubtless eventually encompass more of Verdi’s specific hints at characterization. The unit set of Sir Peter Hall’s production (below), designed by John Gunter, is a semi-circle array of multi-tiered verandas with slatted windows. 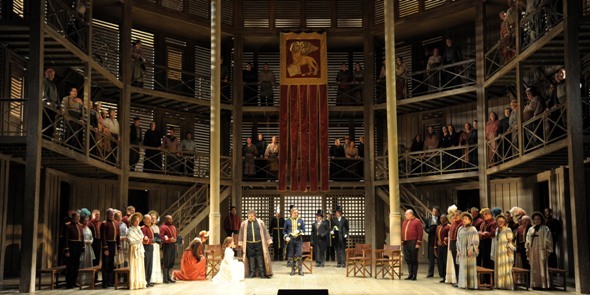 It evokes the inside of Shakespeare’s Globe, perhaps, but it seems more appropriate for Bizet’s “Carmen” than for Verdi’s “Otello.” For significant scenes that any “Otello” concept must address — the storm at the beginning, the romantic starry night for the lovers Otello and Desdemona, the Cypriots’ loving tribute to Desdemona in Act 2 observed by Otello and the tragic bedroom scene — the unit set is either contradictory to the purpose or incidental. These are also scenes characterized by vivid differences, as dictated by the music, to which the concept was not particularly responsive. Duane Schuler’s terrific lighting saves the storm scene. There is little evocation of the starlit night, an interlude that unfolds quite magically, from the standpoint of the music, like Wagner’s “Winterstürme,” and demands much more visually than this production allowed. Hall hides Desdemona’s encounter with her loving subjects so thoroughly that Verdi’s extended attempt to positively underscore her sweet character is all but nullified. And the bedroom scene becomes an enormous signifier of death’s approach, white, stark and monumental, arena-sized, even as Verdi’s music zeroes in on the most intimate and deeply complex psychological aspects of this tragic couple’s demise. In his first conducting engagement with the Lyric, Bertrand de Billy had his hands full on this rocky night. But he ably accommodated the cast change and proved broadly exciting, if not specifically attentive to Verdi’s word by word characterizations, or to some matters of balance, particularly in the big ensemble numbers. One really does want to hear those voices soar above the din and not the other way around. Given the limitations of the physical production and the urgent reality of the mid-show casting change, not to forget the major role debut of Martínez, revival director Ashley Dean also had his work cut out for him. It all went reasonably well — exceedingly well in the drinking scene and duel, perhaps the best overall work of the night by all forces combined, erupting into fabulous chaos at the height of Act 1. The chorus, prepared by Michael Black, sounded great. And in a generally strong supporting cast, Italian tenor Antonio Poli (top right) was a standout as the duped and drunken Cassio, whose thrusting and staggering was high entertainment from start to finish. In his American debut, Poli seemed the real deal — intelligent, agile onstage, possessed of a particularly expressive and beautiful voice. Lyric Opera of Chicago dedicates this season to Bruno Bartoletti: Read about his long Lyric career. Saw this production October 25th, 2013. My birthday. Not as thrilling, polished as I hoped. Did not enjoyed Botha’s “Otello”; Flat and two-dimensional. Struckmann worked hard to give a good, dimensional Iago. Convincing yet pushed at times. “Si pel ciel..” was anti-climatic, (no thanks to orchestration and Botha). Ana-Maria Martinez’s Desdemona, fantastic (can’t believe it was her debut). Antonio Poli. Perfect Cassio. Young, fresh, beautifully solid lyric-tenor, in the tradition of Wunderlich, Gedda, Bjoerling, Pierce. 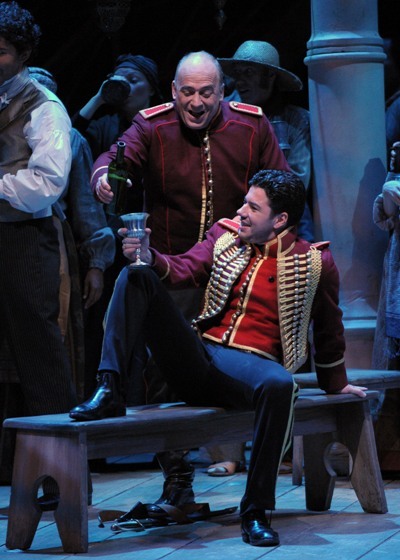 I LOVED HIS CASSIO! Poli’s singing and acting along with Martinez’s beautifully, sensitive and confident Desdemona saved the opera for me–on my BIRTHDAY! Expected more from world-class opera production. 3 out of 5 rating from me. (Cont’d. )…set, overdone. Took up three-quarters of the stage; Too much focus on the “Globe theater/Stratford-on-Avon” concept; took away from dramatic changes in scenes to come. Bedroom scenery, dull, flat, boring…big giant drapery? Really? Production scenic concept went from the huge and overstated to small and unmemorable. Two-thirds of the stage was chorus! They sang well. Just took up a lot of empty, anti-dramatic space. The beginning storm scene was barely alive–both from the direction of chorus and especially THE PIT. This production was missing VERDI’s VERISIMO DRAMA!! Ohh…did I mention I loved Antonio Poli as Cassio and Ana Maria Martinez as Desdemona?